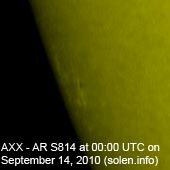 Last major update issued on September 15, 2010 at 04:45 UTC. The geomagnetic field was quiet to unsettled on September 14. Solar wind speed ranged between 283 and 384 km/s, most of the day under the influence of a low speed coronal hole stream. 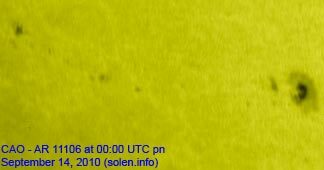 Solar flux measured at 20h UTC on 2.8 GHz was 80.7 (up 0.5 over the last solar rotation). The planetary A index was 9 (STAR Ap - based on the mean of three hour interval ap indices: 8.9). Three hour interval K indices: 12321233 (planetary), 11422332 (Boulder). Region 11106 lost a few spots and appears to be fairly stable. C flares are possible. September 12-14: No obviously Earth directed CMEs were seen in LASCO or STEREO images. September 11: A filament eruption (centered in a large plage area) early in the day in the northeast quadrant was associated with a partial halo CME in LASCO images. 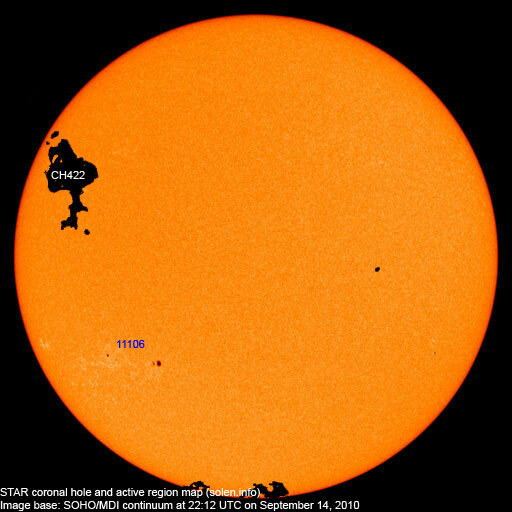 A large recurrent coronal hole (CH422) in the northern hemisphere is rotating into view at the northeast limb and will likely be Earth facing on September 17-20. Long distance low and medium frequency (below 2 MHz) propagation along paths north of due west over high and upper middle latitudes is poor to fair. Propagation on long distance northeast-southwest paths is fair. 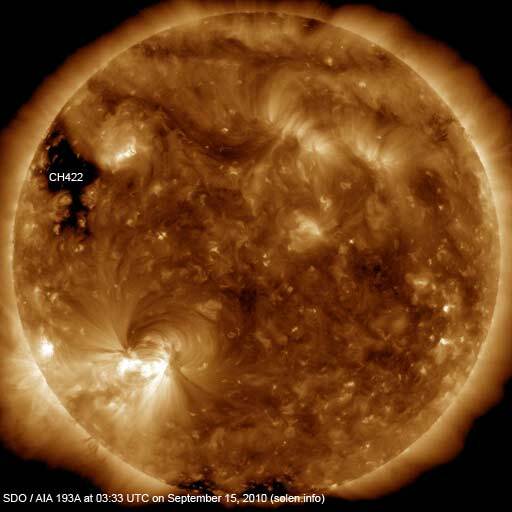 The geomagnetic field is expected to be quiet to active on September 15 due to coronal hole effects and possible effects from a CME observed on September 11. Quiet conditions are likely on September 16-19.